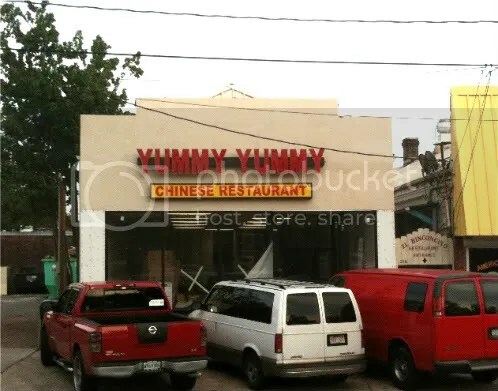 Recently I went to Yummy Yummy for lunch, as well as an attempt at research. Fortunately, I happened to luck out on both. I arrived right at noon which made meeting with the owners absolutely out of the question. Therefore, I decided that I would make observations instead and scribble them down in my handy little notebook. First, I must say that everything I witnessed was incredible. When I walked in, I immediately noticed that there was not an empty table in the whole place. It was swarming with people who were eating, talking, and moving about. People were literally waiting in line to go through the buffet with to-go boxes. The buffet line itself was packed and cooks kept appearing from the rear of the restaurant to replenish empty trays of food. Two pretty girls, my age or younger, were mastering the entire restaurant. They would take turns checking out customers at the register, refilling drinks, supplying napkins, clearing tables, etc. And boy were they fast! These girls flipped tables like I have never before seen. Though the walls were sparsely decorated, the variety of people within seemed to make up for it. I looked around and saw construction workers, business-folk, young people, families; the list could go on. This made me start thinking: Do these people live here or work here? Or perhaps both? Or the opposite: neither? I mulled these ideas about in my head while I stood in line for my own lunch. At $3.50/lb of Chinese food to go, I knew that Yummy Yummy would soon become a favorite. Hopefully, as I get to know the place better, I might be able to answer my question about the people who choose to eat in Mid-City.